Chocolate cookies are always fine with me. 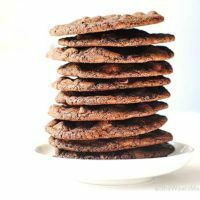 This Double Dark Chocolate Cookies Recipe is better than fine. Much better. 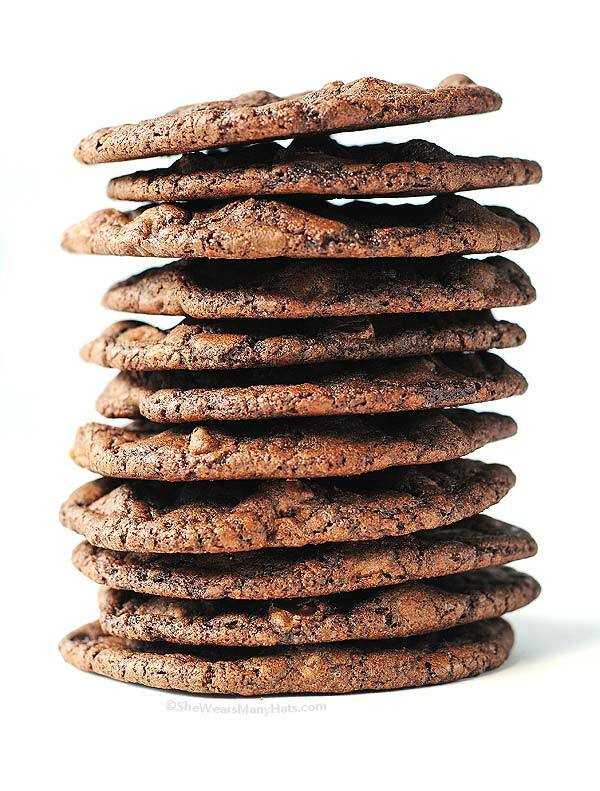 Seriously, if chocolate is your thing, you have got to make these Double Dark Chocolate Cookies today—like right now. If you’re hesitating at all, both of our children have already requested another batch to be made, one of whom is a non-chocolate fan. So if you need a place for extra cookies to land, I’ve got a couple of teens who’ll gladly take them off of your hands. But I doubt you’ll need their assistance. Go ahead and hunt down the Dark Cocoa powder for these. It’s worth the extra effort to find it. Most groceries are carrying it, from what I’ve seen. These days, I tend to keep it well stocked, as it comes in handy for my daily morning mocha, and I pretty much use it now for all recipes that call for cocoa powder. While you can use either light or dark dark brown sugar, I prefer dark brown sugar for this recipe. The intensity of the molasses adds depth and balances the dark chocolate, plus the aroma of dark brown sugar … oh man … it reminds me of caramel and everything old-fashioned. Parchment paper has become one of my regular helpers in the kitchen. Whether baking potatoes or cookies, parchment not only makes things quick and easy for preparing pans for baking, as well as simple cleanup, but it also helps prevent over-browning or burning as quickly. Plus it’s a lot easier to swiftly take a batch of cookies from a pan to a cooling rack in one fell swoop if you wanna. Consider this: Some friends and I divided a very large batch of industrial baking parchment sheets. It ended up being less expensive. I’m stocked for a while! We use kosher salt for almost everything when cooking, it’s a bit more coarse and chunkier than regular table salt. Lately I’ve started using it when baking certain things too, particularly brownies and cookies, like these. I think it does make a difference. The chunkier salt holds up differently during baking which lends little hints of it throughout the finished goodie, instead of a constant saltiness all the way through. I don’t think I’m imagining it. Try it and let me know what you think. 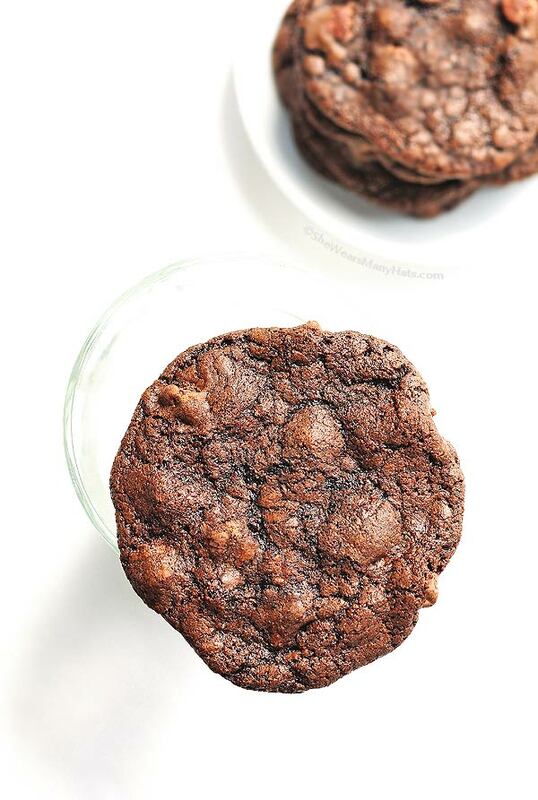 The molasses of the dark brown sugar combines with the dark chocolate for a scrumptious cookie, with just the right hint of salt to balance the sweetness. Preheat oven to 350-degrees F. Line baking sheets with parchment paper. In a saucepan, melt butter over medium-low heat. Whisk in the cocoa powder until smooth. Remove from heat. In a small mixing bowl, whisk together the flour, baking soda, and salt. Set aside. In a separate large mixing bowl, beat the eggs. Stir in the brown sugar, and vanilla extract. until combined. Gradually stir in melted butter and cocoa mixture. Mix until smooth. Stir in chocolate chips until incorporated throughout. Drop rounded tablespoonfuls of cookie dough on parchment lined baking sheets and bake at 350-degrees F for 9-12 minutes. Cool for 1 minute, then lift whole cookie-laden parchment paper from baking sheet and place on cooling rack or dry flat surface to cool (or transfer cookies individually to wire rack to cool and reuse parchment paper). If you can find it, use dark cocoa powder. Parchment paper is a handy helper when baking cookies. Get you some. Dark brown sugar instead of light or regular brown sugar is what I recommend trying for this recipe, at least once. It's mighty nice. This recipe calls for kosher/or sea salt. Regular table salt may be used, just reduce the amount to 1 teaspoon. For larger cookies, I used 1 1/2–2 rounded tablespoonfuls baked at 11 minutes, which makes 3 dozen. Originally published September 13, 2013. YUM! Love me some dark chocolate! Chocolate is most surely my thing!! Must make these cookies. Like today! 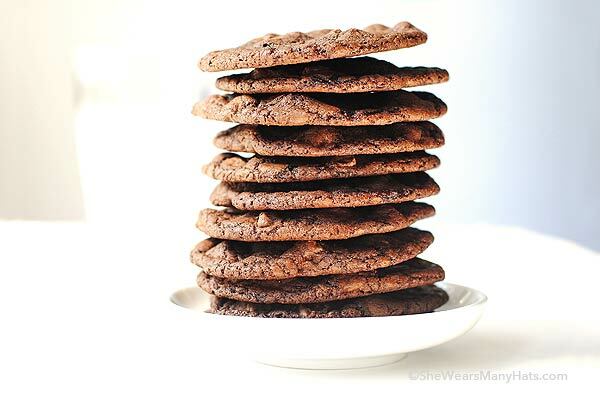 I’m always down for a double chocolate cookie, especially when they look like this! Yum! I need those to dip into my cappuccino this morning. Dark chocolate cookies are the best! I could totally go for a stack of these right now! these are awesome. made using gluten free flour & nut soy choc free chips. for a friend. were delicious. thx for recipe. These are my kind of cookies! hello!,I really like your writing so much! percentage we be in contact more approximately your article on AOL? I require a specialist in this house to unravel my problem. Maybe that’s you! Having a look forward to peer you. Hello, there. These look amazing. I would eat them as is, but I’ll be they’d be great with fillings, too, and they might just satisfy the kids’ requests for those cream-filled variety. I love how thin you made them — means I can eat more, right? 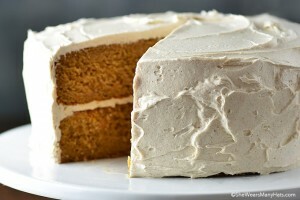 Yum – off to get some dark cocoa powder now! Angie, I’m not sure what to tell you. Did you use baking powder instead of baking soda? Other than that it could be a number things, but without knowing what specific brands of ingredients used, your oven, and other factors, I’m not sure what to tell you. This is one of our favorite cookie recipes. We’ve made these more than any others over the past couple of years so I’m sorry to hear you’re having trouble. Please let me know how it goes. Wishing you much cookie baking success! My batter didn’t spread either 🙁 Do you know what I might’ve done wrong? Bcs I rlly like the taste of these cookies and would like to try again! Without knowing your oven and exact ingredients it’s hard to say, but one tip is to lower the temperature and cook for a bit longer. Maybe try 300-degrees F for about 18-20 for starters and work from there. Let me know how it works if you give it a go. I tried lowering the temperature as you said but still got thick cookies. Don’t get me wrong my kid loves it (she ate 6 pieces while I was just cooling them down) I just can’t get the right temperature or I was thinking of adding more baking soda so it’ll spread more. Not sure though how much more. But thank you! This recipe is great! Wow…first batch out of the oven, my honey wants nuts, going to add to my next batches, what do you think? I think nuts would be fabulous! Tried this recipe last night and my cookies is super yummy even it does not spread as much as yours. It is light and crispy,just the way i like it. Thank u for sharing this recipe. Definitely will do it again. I made these for the second time today and they are perfect! The first batch was a little thicker but I used regular salt without reducing the amount and my dark brown sugar was a little old. They were delish but thicker and cake like. Today I used Kosher Salt and fresh dark brown sugar and they flattened out perfectly and I need to stop eating them before I don’t have any to take to Thanksgiving! Thanks for the recipe! It’s a keeper! I’m so happy you like them, April. They are one of our favorites, and yes, they are hard to resist! 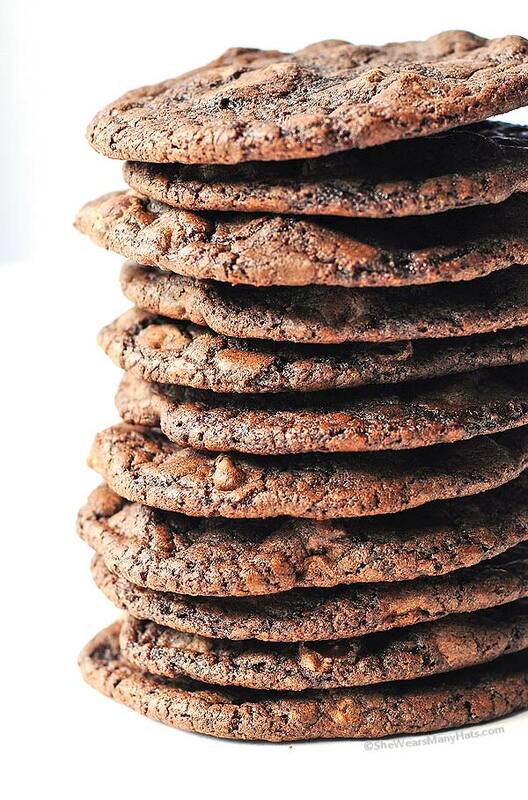 These are the chocolate cookies I’ve been looking for; crunchy, chewy, thin, great-tasting, great-looking cookies. For those having trouble with texture, etc., I highly recommend putting an oven thermometer in your ovens. I’ve never owned an oven that got the temp just right, Also, using mostly or all butter should ensure a flat cookie. Adding baking soda or powder would only raise the cookies more and probably mess with taste and texture. And mix flour, etc., just until combined, no more. I’m going to try baking these longer some time when I’m in the mood for a really crispy chocolate cookie. Thank you so much for this recipe! My family and I thank you! I mainly made this recipe for the thinness and crispness of the cookies. I followed the recipe perfectly. However, they came out of the oven exactly as I put them in! They did not flatten out, but they did crisp.